The Olde Towne Two Drawer Log Blanket Box is handcrafted from white cedar. No matter if you're furnishing a country farm home, log cabin, or hunting and fishing lodge, this rustic, solid wood chest is sure to cause a stir. Sleep easy knowing this beauty is next to you. 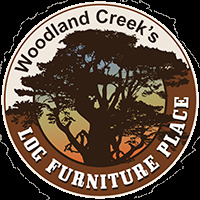 Solid, strong, and handcrafted; our rustic log & real-wood furniture is built to last generations. The Olde Towne Bedroom Collection is quickly becoming one of our most popular lines, be sure to check out the rest of these awesomely rustic products! Two real & two faux drawers. Choice of metal or log handles.